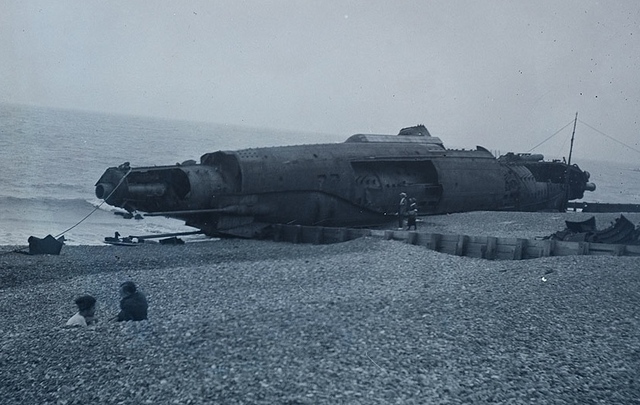 A short way off England’s south and east coasts, under less than 50 feet of water, archaeologists have discovered the remains of 41 German and 3 UK submarines sunk during World War I. Der Spiegel reports that the watery graveyard is home to several U-boats that the German Imperial Navy still lists as missing. Now that the vessels have been discovered, the race is on to explore them before they disintegrate entirely. The German vessels were an integral part of Germany’s naval strategy at the time, inflicting heavy damages on the British fleet. But when discovered, their slow speed and undeveloped torpedo technology ultimately left them easy prey for warships, and nearly half of Germany’s 380 U-boats were lost during the war. Since many of the subs were sunk during active duty, the bodies of the crew are expected to still be inside — what are called “disaster samples.” But further examination and preservation of the sites presents some tricky legal hurdles. Firstly, under UK law, the sunken subs are considered “inviolable gravesites.” And secondly, UNESCO doesn’t consider the wrecks to be archaeological artifacts worth protecting since they’re still less than 100 years old. This entry was posted in The world's submarines, UK Submarines and tagged Submarine, U boats, UNESCO, WW1 on July 24, 2013 by jasonlockley.